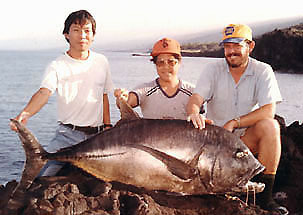 John received the wake-up call of his bell while fishing on the Kona side of the Big Island. He ran to his 12-foot Lamiglas pole and bore down on the Penn 6/0 reel making his 80-lb test Izlon line sing in the wind. It was a beautiful sound!